We leave your morning free today to relax after your flights, and to enjoy the hotel facilities. After lunch you'll enjoy a half day tour of Bangkok, visiting the stunning Grand Palace complex and the Royal Temple of the Emerald Buddha. You'll also stop at the nearby Wat Po, Bangkok's oldest and largest Wat, and home to the largest reclining Buddha. In the evening, we transfer to the train station to board the overnight sleeper train to Chiang Mai, in a second class, air conditioned, sleeping berth. Upon arrival in Chiang Mai we transfer you to your hotel and the rest of the morning is free for you to relax and settle into the hotel. After lunch we take you on a walking tour of Chiang Mai, a lively and bustling city and capital of the North. You'll explore the area around your hotel and climb up to Doi Suthep temple for wonderful views over the city and to see the holy relics of the Buddha. Next you'll stop off at Chiang Mai zoo. Set in an attractive 36-acre park, it has a good reputation and is home to over seven thousand animals. In the evening you'll enjoy a diner in a local restaurant by the river. In the morning we leave Chiang Mai on a pick up truck and head north to Huay Nam Dang National Park for your jungle adventure. You'll start with a 2 hour trek through the hilly forested terrain to a Karen hill-tribe village. Along the way your guide will point out interesting wildlife and you'll spend the night in bamboo huts, just like the villagers. We start the day with more trekking and you'll have plenty of time to appreciate the colourful and diverse flora and fauna of the jungle. After lunch it's onto the elephants for a fun hour and a half ride through the jungle to our rafting camp. Once a the camp, there will be plenty of time to swim in the stream and you'll spend another night with villagers in a bamboo hut. 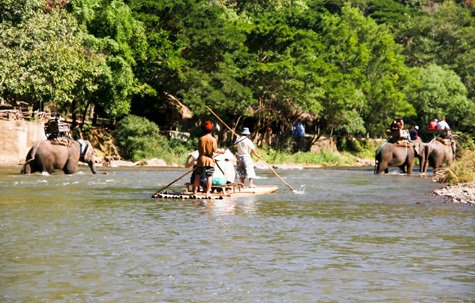 This morning we take to the bamboo rafts for an exhilarating ride down river. This magical ride will take you through steep valleys and mixed forests with the sounds of wildlife all around you. There are occasional gentle rapids and plenty of chances to stop for swims or visit local Karen villages. After lunch we transfer you back to Chiang Mai by pickup truck. Today is totally free for you to rest and recover from your jungle adventure. You can also explore Chiang Mai at you leisure or do some souvenir shopping. There are also plenty of optional extras you can do like joining in with a Thai cookery course, enjoying a Thai massage or perhaps taking a bike ride through the suburbs and countryside around Chiang Mai. In the evening you'll board the overnight sleeper train back to Bangkok.